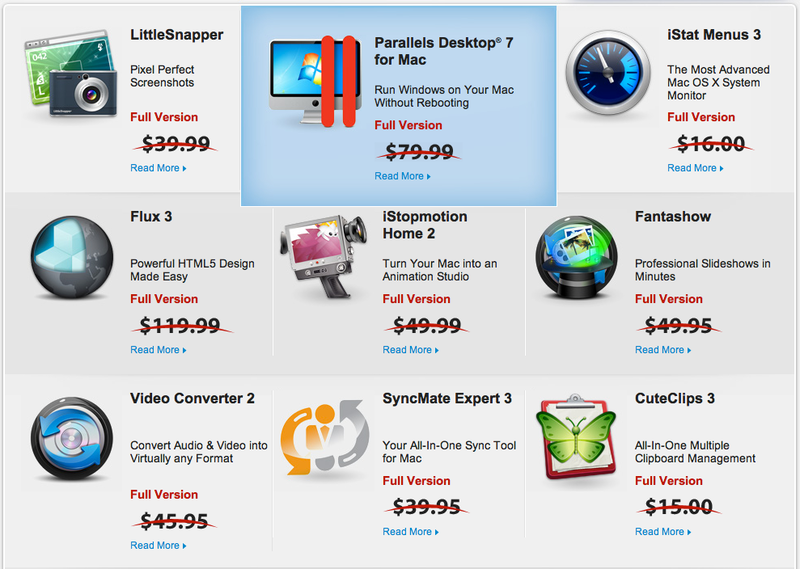 Parallels Desktop® 7 for Mac Run Windows on Your Mac Without Rebooting With over 90 new and improved features, Parallels Desktop® 7 for Mac gives you the best of both worlds! Now it’s possible to run Windows, Linux and more side-by-side with Mac OS X. It’s like having two computers in one! With Parallels award-winning virtualization technology, you can run Mac OS X and your favorite Windows applications at the same time. Now optimized for OS X Lion, Parallels Desktop® 7 for Mac is even easier to use with its brand new Mac user interface and dozens of new features that make running Windows programs on Mac completely seamless. LittleSnapper Pixel Perfect Screenshots With LittleSnapper it’s easy to create screen captures from web pages and your desktop. From entire web pages - including the parts that are out of view in a browser window - to specific windows on your Mac, LittleSnapper can handle it. LittleSnapper also includes powerful tools to enhance your screenshots including callouts, highlights, blur, crop and more. Plus, LittleSnapper automatically organizes all your snaps into collections. Flux 3 Powerful HTML5 Design Made Easy With Flux 3, an advanced HTML5 Web design application, you can create stunning sites from scratch! This software’s amazing WYSIWYG rendering engine means you can drag, stretch and move objects, like in a desktop publishing application, and your web pages will look exactly how you intended. Plus, Flux 3 can generate all your code, edit sites directly off an FTP or SFTP site and much, much more. iStopmotion Home 2 Turn Your Mac into an Animation Studio Boinx’s iStopmotion turns Macs into animation film studios and lets anyone tell their story - frame by fun frame! Easy-to-use yet surprisingly powerful, iStopmotion software lets you experience the magic of creativity with stop motion animation and time lapse tools, including Flipbook printing, Tilt Shift filter, camera support and so much more. Add cool intros, transitions, effects and sounds, then directly transfer your movie clips to iMovie ’08 or later! Fantashow Professional Slideshows in Minutes Aimersoft’s Fantashow is the easy digital slideshow builder that lets anyone achieve professional-looking movies in no time – right from home! With Fantashow you can drag in photos, video and music and drop in any one of 26 built-in themes to turn your treasured digital memories into Hollywood-style movies, shareable on DVD, YouTube, Facebook, on your Mac iOS devices and more. Video Converter 2 Convert Audio & Video into Virtually any Format Aimersoft’s Video Converter 2 software is the quick, easy yet powerful way to convert a wide array of video and audio formats into playable formats on iPod, iPhone, iPad, MP3 players, Apple TV and other popular devices. Fully compatible with Mac OS X Lion, Video Converter 2 makes your Mac work with all audio and video formats, including AVI, MP4, MPG, WMV, MP3, MKA, WAV and many more. SyncMate Expert 3 Your all-in-one sync tool for Mac SyncMate Expert 3 will sync data on your Mac with Android, Windows Mobile or Nokia devices, other Macs or Windows computers, iOS devices, Google or Dropbox accounts and any mounted storage devices. SyncMate can also back up your important data online. It’s easy to sync contacts, calendars, images, music, videos, folders, bookmarks and lots more between your Mac and any supported device. CuteClips 3 All-In-One Multiple Clipboard Management Briksoftware’s CuteClips 3 makes it easy to see clipboard history. This multiple clipboard management software stays out of your way until you need it and records clipboard changes in the background. Just activate it from the menu bar or the hotkey, and the simple and intuitive user interface will quickly find your clips in the text list. Plus, it even saves clips after you restart and always keeps the last 12, providing a big preview for all copied items. Chronicle 4 Never Worry About Your Bills Again Chronicle is the easy-to-use personal finance solution for Mac. Late fees will be a thing of the past with this versatile software that keeps track of all your bills and uses iCal to remind you of upcoming due dates. With Chronicle you can track and reduce your debt, keep proof of payment history, view bills at a glance, make online payments and most importantly, pay your bills on time, every time!